The word "צְפַרְדֵּעַ" appears in only three places in Tanakh: Shemot 7:26 – 8:11, Tehillim 78:45, and Tehillim 105:30. As all three chapters speak of the same plague that was visited upon the Egyptians, the word is a virtual hapax legomenon making it difficult to determine its meaning. "וַיִּצְעַק מֹשֶׁה" – This is the only time that this verb appears during the course of the Plagues. 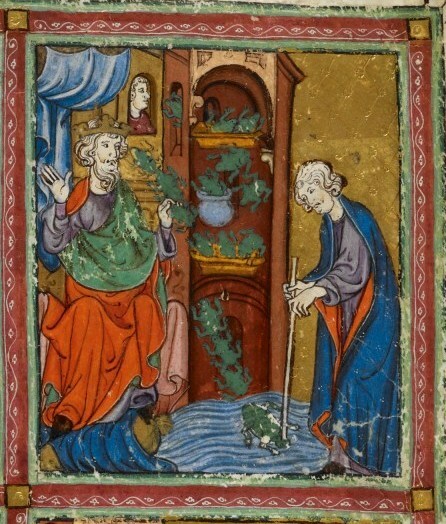 B. Lerner9 suggests that Moshe instinctively shouted in order to hear himself over the croaking of the frogs. Relationship to "תַּנִּין" – Commentators who identify "צְפַרְדֵּעַ" as a crocodile would likely identify the "תַּנִּין" as a serpent rather than a crocodile. See תנין – Serpent or Sea Monster. Nature of the miracle – According to Abarbanel, the natural result of the fish in the Nile dying during the Plague of Blood, was that the crocodiles invaded the land of Egypt to find alternative sources of food. See The Plagues – Natural or Supernatural for further discussion of Abarbanel's general position on the Plagues. 1 The NetzivShemot 7:29About R. Naftali Tzvi Yehuda Berlin combines the two possibilities. 2 See ‏אנציקלופדיה מקראית "צפרדע"‏. 3 Cf. Lekach Tov who tries to show how frogs were brought as a "measure for measure." 4 The identification of "צְפַרְדֵּעַ" as frogs (rather than crocodiles) fits with the view that the plagues show a gradual escalation – see Patterns in the Plagues. 5 The surrounding plagues of blood and lice also do not appear to cause grievous harm. Regarding "עָרֹב", see עָרֹב – Beasts or Bugs. 6 Regarding this notion in general and regarding the Plagues, see also Bereshit Rabbah 10:7, Shemot Rabbah Vaera 10:1. 7 They point out that this argues against its identification as a crocodile. See the Ma'asei Hashem who quips that the Abarbanel (who identifies the "צְפַרְדֵּעַ" as a crocodile) apparently never saw a crocodile. ShadalShemot 8:17About R. S.D. Luzzatto makes a similar argument against the possibility that the "עָרֹב" was wild animals – see עָרֹב – Beasts or Bugs. 8 See also R. Yonah ibn Janach. It is noteworthy that the Torah does not record any deaths resulting from the "צְפַרְדֵּעַ" plague. If they were crocodiles, one would have expected both human and livestock fatalities (like those described in other plagues). 9 B. Lerner, "Crying Out About Frogs," VT 60 (2010): 662-663. 10 This argument depends on the identification of "עָרֹב" as wild beasts – see עָרֹב – Beasts or Bugs. 11 Cf. R"D Sperber attempts (found here) to find a basis in realia for the etymology found in the Lekach TovShemot 7:29About R. Toviah b. Eliezer. See also R"N Slifkin's discussion of Sperber's theory in "Tzefarde'a: Frogs or Crocodiles? ", JBQ 38 (2010): 251-254. 12 Abarbanel states this explicitly, and this seems to also be the underlying assumption of R. Saadia. [Cf. Midrash Tehillim105:9About Midrash Tehillim, Shemot Rabbah10:3About Shemot Rabbah. and RambanShemot 8:15About R. Moshe Nachmanides] A similar argument is made for the identification of "עָרֹב" as wild animals – see עָרֹב – Beasts or Bugs. However, RashiShemot 7:27About R. Shelomo Yitzchaki and ShadalShemot 8:17About R. S.D. Luzzatto disagree, with Rashi suggesting that "נֹגֵף" merely implies a non-fatal attack, and Shadal explaining that the language used in both plagues is simply a figure of speech. See also Ibn Janach. 13 Note, however, that the neighboring plagues of blood and lice do not appear to cause grievous harm. Regarding "עָרֹב", see עָרֹב – Beasts or Bugs. 14 Abarbanel embarks on a fascinating pseudo-scientific and historical excursion to try to demonstrate that crocodiles did not originally live in fresh water. 15 According to R"E Ashkenazi, from the words "וְשָׁרַץ הַיְאֹר צְפַרְדְּעִים" it appears that they were always present in the Nile, and that the significance of their remaining only in the river was that this demonstrated the Divine origin of the plague. 16 See above that the Plague of Blood decimated the crocodiles' food supply in the Nile. Those who understand "צְפַרְדֵּעַ" as frogs presumably maintain that they invaded the houses and ovens simply to annoy the Egyptians. 17 The Ma'asei Hashem dismisses this argument, saying that part of the miracle was that only the frogs in the Nile survived.